Ships today if you order in the next 4 hours 33 minutes. Auto Ship & Earn + 112 Points What's this? 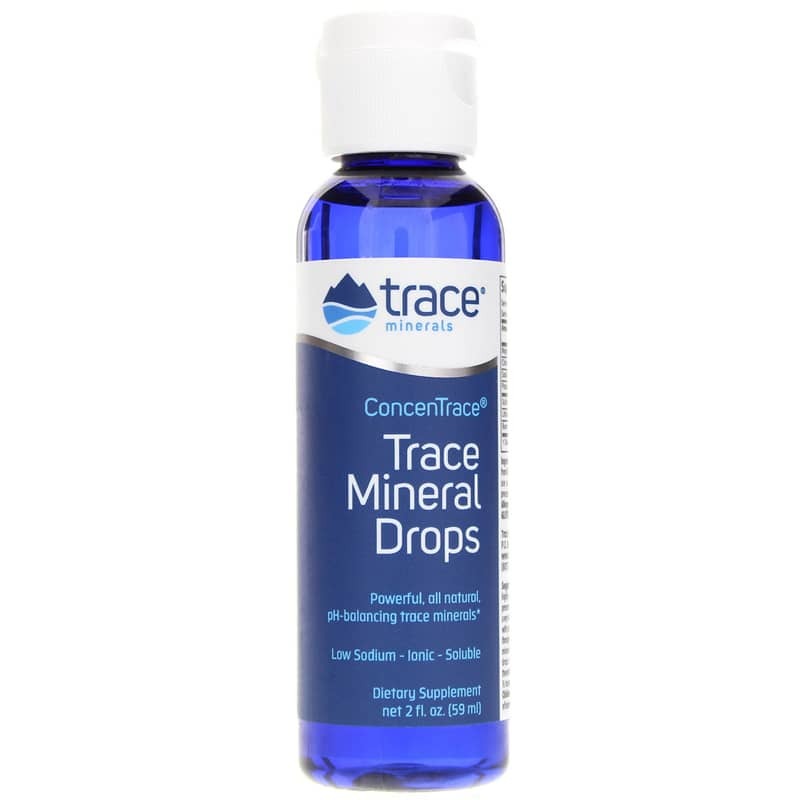 ConcenTrace Trace Mineral Drops by Trace Minerals Research contains powerful pH-balancing trace minerals. ConcenTrace Trace Mineral Drops is the #1 selling trace mineral supplement in the natural channel according to SPINS. It is also one of the most powerful natural health mineral supplements in the world and has many uses and applications. It's impossible to overestimate the importance of minerals and trace minerals for the human body. They are the catalysts for all the vitamins and other nutrients your body uses for developing and maintaining good health. ConcenTrace captures the perfect balance of trace minerals your body needs. Using ConcenTrace every day may help maintain healthy energy levels in your body by providing your body's entire electrical system the minerals it needs to function properly. ConcenTrace contains naturally occurring ionic trace minerals from the Great Salt Lake with 99% sodium removed. ConcenTrace contains a full spectrum of all the minerals in a balance natural to the body. Once harvested from the GSL, Trace Minerals Research uses a completely natural concentration process without the use of chemicals or dyes that removes the sodium from the GSL water. They use solar evaporation technology to concentrate the water, which really means that all we use is natural sunshine! 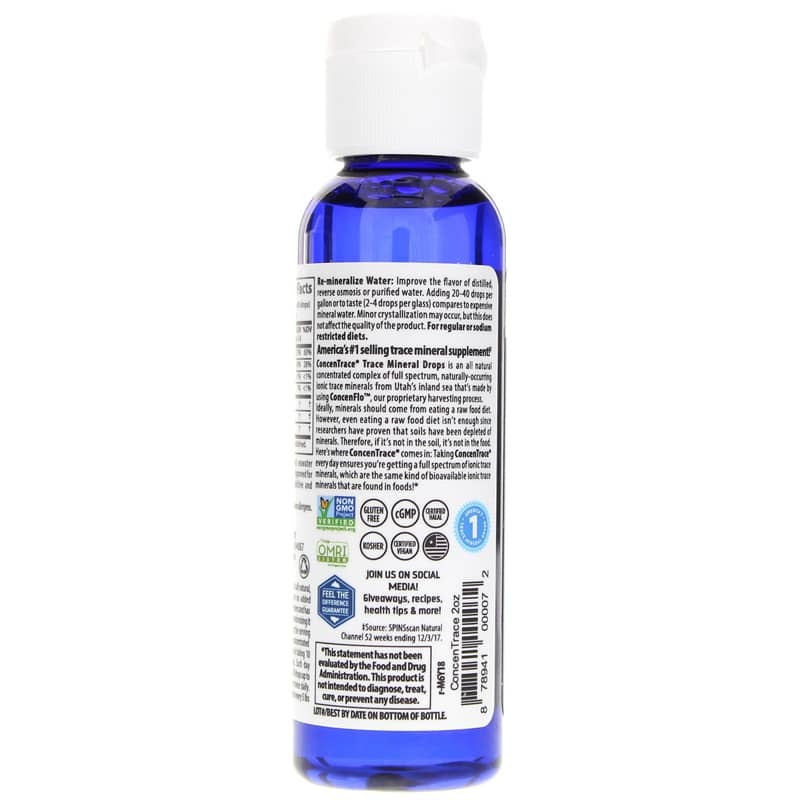 The result of this natural process is ConcenTrace, an all natural ionic trace mineral blend that is 26 times more concentrated than colloidal trace minerals, making it one of the most naturally powerful health supplements on the market. In addition, all of Trace Minerals facilities are FDA cGMP certified (Good Manufacturing Practices) through the Natural Products Association. Ingredients: concentrated seawater from Utah's inland sea, USA. Approved for use as an organic food additive and preserving additive. Contains NO: known allergens. Non-GMO. Gluten-free. Certified Vegan. Kosher, Halal. Adults: This product is all natural, highly concentrated, contains no preservatives, flavors or sweeteners and has a very strong taste. We recommend mixing it with juice or food and dividing the serving throughout the day to mask the concentrated mineral flavor. Begin regimen by taking 10 drops for 3 consecutive days. Each day thereafter, increase serving 10 drops up to 1/2 teaspoon (40 drops) once or twice daily. Children age 1-3: Take 1 drop for every 5 lbs. of body weight. Re-mineralize Water: Improve the flavor of diluted, reverse osmosis or purified water. Adding 20-40 drops or to taste. (2-4 drops per glass) Compares to expensive mineral water. If you are pregnant or nursing, please consult your healthcare professional before using this product. Keep out of the reach of children. Given that this is highly concentrated, a little goes a long ways. I find it helpful to use muscle testing to determine how many drops my body wants since it (for me personally) doesn't always need or require as much as the recommended dosage. Great product for purifying water, etc. its bitter,but it works great. Thank you for providing the essential mineral drops. 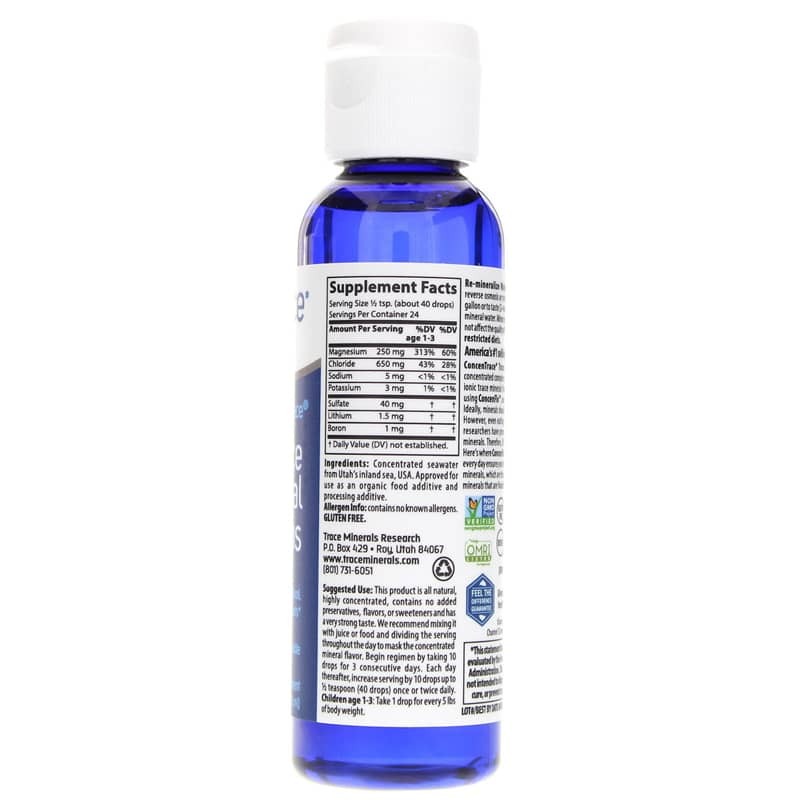 The mineral drops from Natural HealthyConcepts also give drinking water a delightful taste. Everyone should take this product!! I love this product! I personally us this for my joints especially my knees. It helps my knees not feel so inflamed when I work out. My dad uses this product for the same thing. On the plus side I have used it as a magnesium oil for external use. I just feel better taking this... 20 drops at breakfast and 20 drops at dinner. The magnesium and lithium content promote serotonin synthesis which explains the improved mood effect. The owner of Montiff, Don Tyson, takes this too which speaks volumes for the product.